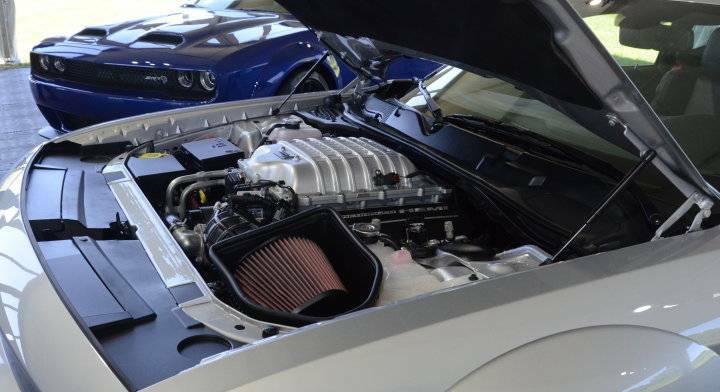 SRT Hellcat 6.2L Supercharged (2015 - ) Would you like the BLACK KEY or the RED KEY? Agreed, I think the best place for an intake scoop would be right under and just behind the edge of the chin spoiler. It would be out of sight and not ruin the lines of the car plus any air that made it under the chin spoiler would be sucked into the engine, enhancing the negative pressure under the car. Of course ducting and ground clearance play into this as well. The hood's alright with me and the fact that it's functional I think makes it worth it. That filter is red like the Demon filter so that means you've got to clean it and oil it regularly. Do not like the new hood at all. I don't like them at all. They remind me of the ones on a Pontiac Formula 400. The new Redeye hood is totally functional and that's what is really important. A8, Sunroof, Extreme Carbon Fiber Brake Pads. I see more likeness to '69 Pontiac Trans Am to me...then again there weren't a lot of '69 TAs built. In order to be able to post messages on the Dodge Challenger Forum: Challenger & SRT8 Forums forums, you must first register.